If you spend a lot of time behind the wheel, you’ll know how uncomfy standard seats can be, even if you have a decent vehicle with plenty of plush leather. Many factory-issue seats just don’t give your back enough support. This can be particularly damaging to the spine if you spend lots of time on the road. Today, we’ll show you how to get around this with the 5 best car seat massagers. With so many poor products flooding the market, we chose to double down on only the cream of the crop here. What Should You Look For In A Car Seat Massager? Is There a Kneading Function? What Are The Benefits of Car Seat Massagers? If you’re looking for a straightforward mobile massage on a budget, the Relaxzen is a smart choice. With an impressive range of settings and finished in a subtle black leather-look, this car seat massager will look great in any vehicle while delivering many therapeutic benefits. While the Relaxzen is not a shiatsu massager, the 5 potent motors kick out a nice and powerful vibrating massage when you’re on the road. 5 modes and 3 intensity levels along with 3 auto-shutoff settings allow you maximum flexibility without spending a fortune. With the 4 target zones, you can choose to focus on your lower, middle or upper back while for footballers, it even massages your thighs as an added bonus. You’ll get an adaptor thrown in so the Relaxzen is the ideal addition to any car. The padded cushioning means you’ll be sat back in plenty of comfort while also enjoying effective pain relief and relaxation. 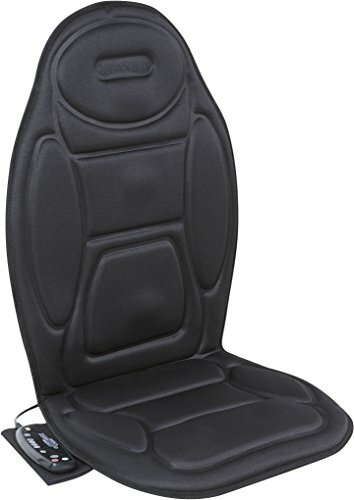 The build quality of this car massage seat is impressive and, perhaps the best thing, it comes in at about the cost of a restaurant meal so it’s great for anyone on a tighter budget. Another standard non-shiatsu massage cushion, the extremely well-reviewed Five S uses vibration to punch back against back pain. This is a heated unit with a workhorse of a motor meaning you’ll get a robust massage at a very keen price point. Arguably the most popular vibrating car massage seat on the market, this affordable and durable cushion from Five S is tough to beat. Primarily designed to laser in on back pain, you’ll enjoy 4 automatic massage programs. You can switch up through 3 speed settings and you can choose whether or not you’d like the added benefit of a dose of heat. Although its core focus is back pain, the Five S also offers relief if your neck and shoulders are feeling the strain of a long journey. It can also hit the thighs if your legs feel stiff. 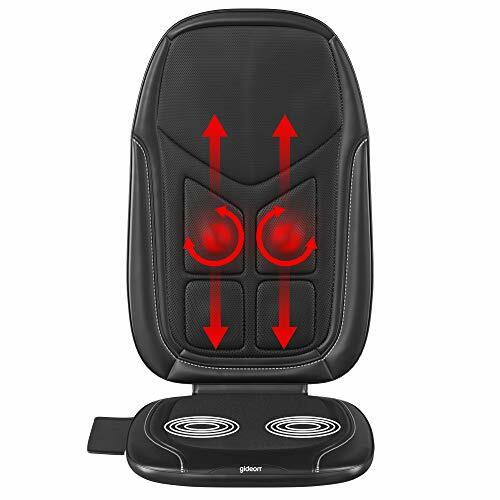 While you won’t get a full-bore shiatsu massage, the 10 vibration sources and incredibly keen price make this a firm favorite for the best car massage seat on the market. Famous the world over for their ergonomic and comfortable footwear, Dr Scholl’s bring that expertise to the fore with this full cushion car seat massager. Although it’s relatively basic, you’ve got all the functionality you need for a first-class massage. You can easily slip this seat into a bag for your complete convenience. If you want a car massage seat from a brand you can trust without a ruthless price tag to match, this 5 motor model from Dr Scholl’s fit the bill perfectly. The motors serve up a pretty powerful massage. You can tweak this to your exact preferences using the 3 intensity settings. There’s a handset thrown in that you use to activate the heat function. Detractors point to a fairly lumpy feel to the cushion but this is fairly subjective. A fairer accusation is that this unit is quite noisy when it’s running so if you prize total tranquility in the car, look at another seat instead. While you won’t get many bells and whistles, if you like the idea of a simple but effective car massage seat, the Dr Scholl’s deserves a place on any shortlist. An authentic shiatsu massaging cushion, the Gideon is remarkably competitively priced considering its functionality. Whether you want this to act as a car seat massager or to use it at home, you’ll enjoy both shiatsu mode and vibration mode. You can even combine the two for a belt-and-braces approach to mobile massage. If you want the rigorous effects of a shiatsu massage while also being able to enjoy a vibrating massage when the mood takes you, this 2-in-1 cushion is the perfect solution. Whether you want to embrace the 4 nodes powerfully administering a full-back massage or the more restrained Relaxation Mode to de-stress you during a long car journey, the Gideon offers you a truly adaptable massager at a keen price. Spot-focus massaging allows you to home in on any niggling spots while the 3 levels of vibration makes sure you have plenty of choice there too. As a parting bonus, you can activate the heat setting for an added boost of therapy and auto-shutoff is in place to prevent any accidental overheating if you leave it switched on when you leave your vehicle. 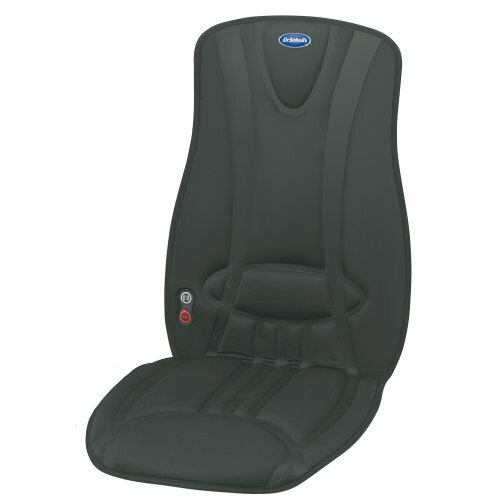 Rounding out our car massage seats is another shiatsu cushion which is a little more expensive. In return for outlaying a bit more, you’ll get a premium massage seat from a household name in the industry. The subtle cream and brown design will look wonderful setting off the driver seat of any vehicle. 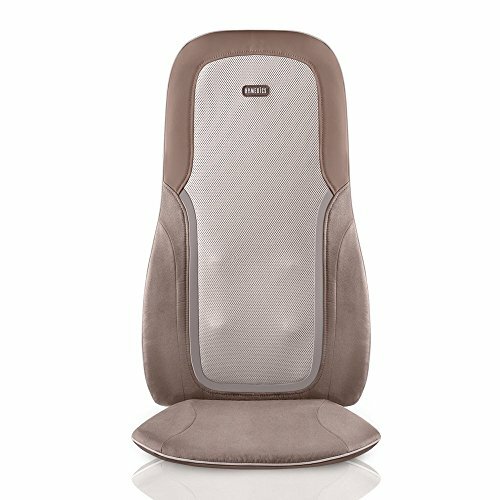 HoMedics have a hard-won reputation in the massage seat space and this shiatsu massage cushion ideal for your car is no exception. 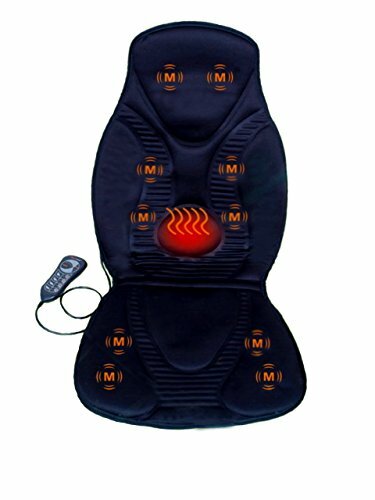 The air compression shiatsu massager makes certain your whole back gets a relaxing and relieving massage ideal for those long car trips. You can flit between 3 intensity levels to get the massage you want when you want it. Outstanding straps keep the cushion firmly in place even if you wriggle around on your seat. This cushion is also heated to give you an extra burst of pain relief when you need it most. Zone control allows you to take charge and choose between a full-back massage, lower back massage or upper back massage. You can also opt for spot relief if you have a specific area that need attention. Depending on what type of massage you’re looking for when behind the wheel of your ride, there are a few simple things to look out for. Take the time to study these different areas and you’ll have no problem getting the best car seat massager for much less than you might imagine. The overall dimensions and weight of the car seat massager should be one of the first things you double down on. Most, fortunately, come in a fairly standard size that will slip onto your car seat with ease. Although few of these cushions are particularly heavy, think also about the weight if you plan to carry it around anywhere with you involving more distance than simply popping down your driveway to the car. Depending on how particular you are about the way your car looks, you might want to choose something that meshes with the aesthetics of your vehicle. We would suggest that design should come secondary to functionality but it’s worth pointing out that not all car seat massagers look the same so roll with what’s easiest on the eye for you. Shiatsu is a Japanese massage technique that a handful of the more expensive car seat massagers manage to replicate quite effectively. This will be disclosed clearly on the listing. Most cushions deliver a simple massage but we’ve included a shiatsu model here so there’s something for everyone. If you experience back pain that comes and goes, it’s worth looking out for car seat massagers with a broad spread of speed and intensity settings. Whether you want the comfort of a slow and very gentle rub or something rather more vigorous, many of the best car seat massagers offer you a great deal of choice. There’s no right or wrong answer here so choose in line with your personal needs. Linked to the idea of settings, depending on how tiresome you find navigating this type of thing, it might be worth looking out for a car seat massager with memory recall. Once you find your favorite setting once, you won’t need to keep on experimenting and searching, just you hit Memory then find your optimum settings with the minimum of fanfare. Alongside a massage function, many of these massaging cushions also vibrate to give you another layer of experience. If you need the additional relief provided by a vibrating cushion, pay close attention to the listing, as there are plenty of models at your disposal offering this extra. If you often experience knots of pain in your back, many of the more capable car seat massagers come packing a kneading function. This can work wonders for easing away that niggling pain through a nice deep action that won’t cause you any harm but really hits the pain points. If you’re looking for maximum pain relief rather than a purely recreational massage, a heated unit makes perfect sense. Whether physical heat or infrared heat, a massage cushion that warms your back will help to reduce pain signals sent to the brain and make sure you stay as comfy as possible when eased down behind the wheel. Now you’ve got an idea of what to look out for, what’s the point of investing in a car seat massager in the first place? Muscle Pain and Tension: If you regularly find yourself with sore muscles after the gym, a car seat massager is a great way to get in some quick pain relief while you drive home to a nice hot bath. Back Pain: Perhaps the most common reason behind purchasing a car seat massagers, these nifty cushions can work wonders for a wide range of back complaints. This is particularly valuable if you drive a taxi or spend a great deal of time commuting. There’s plenty of research indicating that massage can be a great short-term solution for back pain. Neck Pain: Whether you get the occasional stiff neck or you suffer from frequent neck problems, the benefits of a car massage seat extend beyond your back and can help soothe a sore neck quickly and fuss-free. Shoulder Pain: A very common issue, shoulder pain can often be addressed by a massage cushion or seat. These devices will stimulate your muscles and can help alleviate stiffness and soreness in the shoulders. Muscle Knots: If you spend lengthy spells behind the wheel and find yourself blighted by your muscles tightening up into knots, buying a car massage seat is a natural way to fight back. Mood: Massage can release hormones that perk up your mood. If you find yourself suffering from down days, you might just be amazed at the difference a mobile massage makes. We trust you’ve found plenty of tempting car seat massagers to tempt you into upgrading your comfort while driving. If you value the health of your back and you spend lengthy spells driving, you should consider a massaging cushion as an investment rather than an expense. Come back soon for more impartial advice about all aspects of your car! Thanks for your very informative article. I have more options than I realized, and will be purchasing one of your suggested models to make my 120 mile daily commute more enjoyable.